An unexploded rocket found buried in the dirt in a residential village. Laos is the most heavily bombed country in the world. During the Indochina War, American planes flew 580,000 bomb runs over Laos and dropped more than 2 million tons of bombs, including over 200 million cluster bomblets. Today, as many as 27 million bomblets remain. 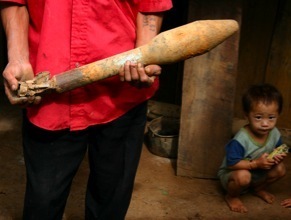 Since the war ended, more than 40,000 Lao people have been killed or injured by old ordnance.